Count The Cost: The price of being a disciple. I once sat in my living room with an Army recruiter discussing my desire to enlist in the Army. Sitting at the table the recruiter went over all of the benefits of joining the military. We discussed everything from pay to education. At the end of our conversation I was encouraged by the recruiter to talk it over with my family and look over all we had discussed. There were things that were left out of that conversation and not printed in the pamphlets that, though they were common knowledge, in light of all of the benefits escaped the thoughts of an eager boy. My fear is that we have done this very thing with our proclamation of the gospel of Jesus Christ. We express the love of Jesus, the grace of God, and the price paid by our Savior, as we should; but do we council people to count the cost before they claim the name of our Lord? This is a difficult question for me to consider, after all, I desire nothing more than to see people enter into discipleship and walk with Christ, but what will it cost? Salvation is a gift of Grace by God and we have no claim in our own salvation.(Eph. 2:8-9) This being true, the cost of discipleship is great. We do not see Jesus turning people away from following Him, but we do see Him inform those who wish to do so as to the cost of being His disciple. I love the lyrics of the song written by Kristien Stanfill (I think), “Jesus paid it all, all to Him I owe…” because it is so incredibly true. With all that Jesus has done to make possible our salvation and redemption unto God, we owe Him nothing less than our very lives. 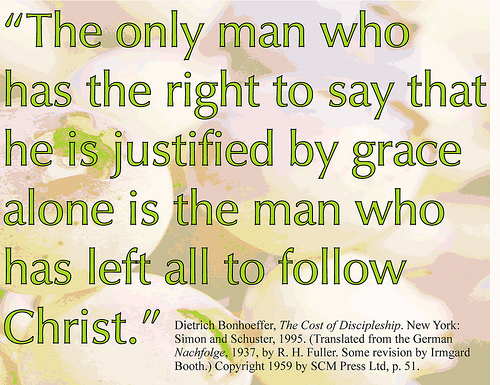 Dietrich Bonhoeffer opens his book titled “The Cost of Discipleship” with the quote, “When God calls a man, He bids him come and die.” In following Jesus you have accepted the call to come and die for Him. To present the Christian life as one that does not cost anything of the believer is not only a deception, but a misrepresentation of what a life in Christ really is. Jesus calls us to a life of difficulty that requires armor (Eph. 6), and a total sacrifice of ourselves. Yes, this is a difficult teaching, but a necessary one. Even though Jesus requires our lives, our comfort, and our desires to be sacrificed for Him, He also promises eternal life with Him full of joy and un-explainable peace. When looking at His requirements of us in being His disciples, only one answer can be had; what other choice is there?